Abrupt climatic warming induced by elevated levels of solar radiation reaching the Earth would have melted the surface of the ice sheets and caused perched meltwater lakes to form on the ice sheet surface. A dam failure of one of these lakes would have produced a meltwater avalanche that would have grown in size as it traveled across the ice sheet and accumulated the contents of perched lakes along its path. The result would have been a wave of meltwater reaching a height of 500 meters or more and travelling forward at hundreds of kilometers per hour. LaViolette coined the term glacier wave to refer to this phenomenon;(5) see Verified Prediction No. 12. 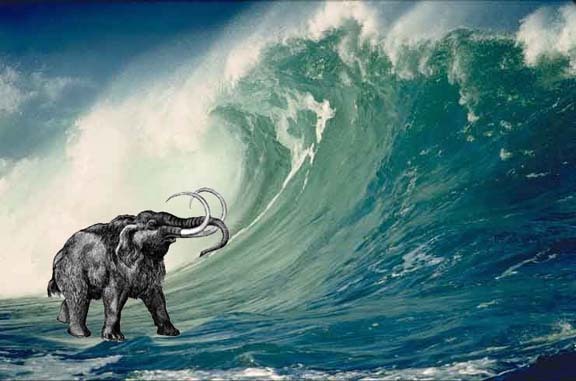 The occurrence of global warmings during the Alleröd and at the time of this 12,887 years b2k SPE/CME event would explain why many of the extinct megafauna are found interred in flood deposits. as it descends to the edge of the ice sheet. land tsunami overtaking a mammoth unawares.